The Kwara State chapter of the Peoples Democratic Party (PDP) has commended the administration of Governor Abdulfatah Ahmed for its development strides in the State. In a statement by its Public Relations Officer (PRO), Mr. Tunde Ashaolu on Thursday, the party noted the present administration has made several impacts despite the lean financial resources at its disposal. 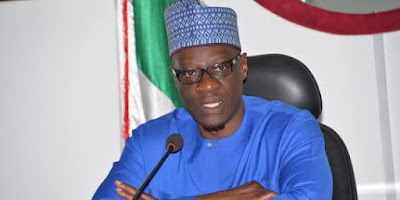 It said that under Governor Ahmed, Kwara has witnessed progress in various sectors ranging from road infrastructure, education, health, agriculture, SME development among others. The party also commended the governor for initiating various sectoral reforms such as the internal revenue reform, Kwara Infrastructural Development Fund (IF-K), Off-taker Demand Driven Agriculture (ODDA) scheme and the Kwara Health Insurance Scheme. It noted with delight that these reforms have placed Kwara on a pathway of sustainable development, noting that the internal revenue reform increased the State’s IGR and that IF-K has also boosted the capacity of the State government to implement projects. The party said it was impressed with the spate of ongoing infrastructural projects across the State and expressed confidence that the projects would be completed before the end of Governor Ahmed’s administration in 2019. “We are impressed with the various ongoing projects spread across the State and confident that all these projects will be brought to completion level before the end of Governor Ahmed’s tenure for the benefit of all Kwarans. It also mentioned the ongoing Light-Up Kwara project, Ilorin Water reticulation project and the repositioning of the state-owned media houses – Kwara TV, Herald newspaper and Radio Kwara. The Kwara PDP also commended the Senate President, HE Dr. Bukola Saraki for his various interventions through his numerous constituency projects and facilitation of employments for youths in the State. The party added that it is "solidly behind the presidential ambition of Saraki." On the forthcoming 2019 general elections, Mr Tunde Ashaolu said the State Working Committee under the chairmanship of Alhaji Kola Shittu is committed towards the success of the party at the polls, stressing that the party will emerge victorious at both the state and national levels. The party urged Kwarans to continue to support and keep faith with the leadership of Bukola Saraki and Governor Ahmed in the State.